In a region of farms and small cities, these institutions collectively are a powerful economic force with over 12,000 full time and an additional 4,000 part time employees. Over 72,000 students are enrolled in colleges and universities in Western Massachusetts representing 9% of the total population of the region. Finally, direct expenditures of these institutions was estimated to be $1.432 Billion, contributing to the vitality of the region. A view of the main artery in Springfield - State Street - with Springfield Technical Community College campus in upper left of picture. lists the economic impact of higher education institutions in New England as $118 Billion. Although Massachusetts, a world-wide leader in higher education, contributes the majority of that amount - $81 Billion, the other New England states all have impact in the Billions of dollars. In this time of economic turmoil, higher education as an industry should be recognized and supported. WHAT CAN BE DONE AS STUDENT DEBT EXPLODES? 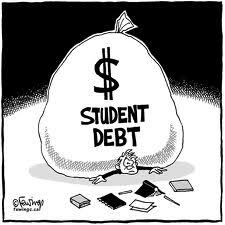 This generation of college students enters the workforce with a debt burden that will take years to repay. And unlike credit card debt, student loans typically are not eliminated through bankruptcy. The long term consequences for college graduates (and those that do not finish college) are significant: less disposable income after starting work, more stress and pressure due to large debts and more difficulty in making large purchases such as homes. Reducing student debt would have a beneficial effect on the housing market as young educated couples would be better credit risks for new homes. What, however, can be done? Keeping public colleges open and affordable is a key step. States need to pay attention to their public college systems which provide excellent education at a reasonable cost to students. In this light, the recent reductions to public colleges and universities by State Legislatures and Governors is troubling, compounding financial pressure on students. To reserve these trends, students need to become politically active in defending their interests: a chance for a college education at an affordable price.